You produce an event, and you want sponsors. Well, maybe you’re not sure you really want sponsors, but let’s be honest: you definitely want the money. You may be a little unclear about what’s involved. And maybe you have no idea where to begin. If this describes your situation closely enough, you’re in the right place. We’ll answer these questions and get you on the right path. But first, you have an important decision to make. The right raw materials—a great event, compelling marketing operation, enthusiastic audiences—to convert into viable sponsorship opportunities. We can shape all this together into a strategy to help you get sponsors. Before we do, you need to answer a question. That is: What kind of seller do you want to be? This question may be a curious one to you, but I guarantee you that most people never ask it. By defining the type of seller you want to be, you set an intention. You avoid jumping in with something subconscious operating as your default. You will thank yourself when faced with tough decisions when you have to advocate, move forward, decline, negotiate, and refine on the fly. Being clear on your intention can make your job easier and more transparent. Pauper. The pauper, as the name implies, is begging. He or she doesn’t really understand the value of the organization’s sponsorship program and desperately focuses on getting money. The individual may even see the big rich corporation as nothing more than an ATM machine. Pompous. The pompous seller is the one who covers his lack of skill or perhaps poor offering with a bombastic personality. He or she may disguise insecurity with know-it-all or arrogant behavior that prevents any meaningful connection with the sponsor and colleagues. Partner. The seller who is a partner builds trust and is in service to his or her sponsor along with his or her own organization. Quick thinking, solution-oriented, and creative, the partner always has the sponsor’s best interests at heart. In fact, he or she is willing to say “no” to an opportunity (and the money) that is not in both parties’ best interests. There actually is one more type: the Slimy Salesperson. You know the type, too. But have you ever met him or her? I’m convinced this image is what we fear becoming, a figment of our imagination. From these four descriptions, you know the right answer is to set your intention to become your sponsor’s partner. When you have partners and are one yourself, you have companies that collaborate with you to make your event, program, campaign, or initiative a great success. Doesn’t that sound a lot better than the other three options? Now, back to your questions about getting sponsors and where to begin. If you’ve committed to being a partner, you know that you’re not going to start by simply craving corporate money. Value. First you have to assess, define, and develop the value your organization will offer. In other words, what do you have to sell? And why would someone want to buy it? Business Development Plan. When you’re clear about the value you offer, you’re ready to define your ideal buyer. What industries and specific corporations would be interested in leveraging the opportunities you have to offer? What would they gain by doing so? Develop and prioritize your prospect list. With these two steps complete, you’re ready to get out there. Who you are as a seller is now your touchstone, your north star. When you partner, you will win. Nonprofits hire Gail Bower as their revenue strategist. She uncovers reliable sources of revenue so that organizations become self-sufficient. They’re always able to generate money when they need it. Clients have doubled, tripled, and quadrupled their earned revenue in under a year. And that’s just the first year. 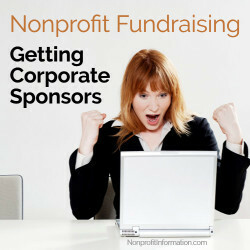 To learn more about sponsorship and for more information, visit GailBower.com.